We reviewed what software to use to make your iTunes files sound at their best when you play them through your Mac computer. Now we want to know if there is a remedy for your iPod or iPhone that will make your compressed music files sound great on the go. Let’s face it, portability and convenience is what the iPod is about. Compromises have been made to achieve this goal, however. We want to remove the artifacts of those compromises, if possible. There is good news. 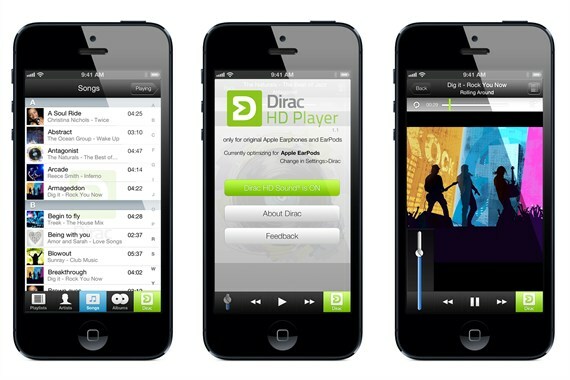 The Dirac HD Player is a new app that can be downloaded from the iTunes store to any of your iOS devices. (The app is compatible with the iPhone 4, 4S, 5 and iPod touch – fourth and fifth generation). What it does is clearly heard in one listen. How it does it is not clearly understood. The Dirac is doing something to the sound that can only be described as magic. The Dirac HD Player works within your iTunes files by replacing the music player on your iOS device with its own player. It doesn’t totally replace your current music player. You can always return to it if you so foolishly wished to do so. The new player simply modifies the sound signature of your Apple EarBuds through what is called “digital signal processing” (DSP). Does it work with other headphones? No. It has been custom designed to work either with the EarBuds or the Earphones produced by Apple and no other device. DSP is not a graphic equalizer. It is not a psycho-acoustic sound effects machine. The Dirac HD Player controls the sonic playback of EarBuds by overcoming the acoustic limitations inherent in those devices. Let’s cut to the chase. This player makes the Apple EarBuds (forget using the Apple Earphones) sound like an expensive pair of monitor quality headphones that professionals might use. I am not kidding. I compared my iPod Touch playing iTunes files on its built-in player using my monitor headphones. Then I switched to the Dirac HD Player playing through my Apple EarBuds. Night and day difference. There was more transparency and articulation. There is much greater dynamic range. A piano can actually sound like the percussive instrument that it is. The Dirac must surely improve the impulse response of the Ear Buds. Without the Dirac and the EarBuds working together the sound seems muddy by comparison. Overall, the sound is very neutral, open, and lifelike. When the music is not particularly smooth then the Dirac does not sound smooth either. It just sounds more like music and much less like a digital recording. In fact, it does not really sound like digital at all. What a revelation! The app is available in a free Lite version as well as a full version with extended functionality for $2.99. The extended functionality is worth the price because it enables you to keep or your playlists and Apple player functionality. If you have thrown away your EarBuds go buy a new set. Apple has significantly improved its EarBuds in the latest model. They sound respectable on their own for a $29 device. But with the Dirac HD Player they are on a whole new level. You will not believe it. The Dirac HD Player is made by Dirac Research AB in Sweden. This company is famous as a sound technology provider to Rolls Royce, BMW, Naim Audio, and other world leading brands. How they are able to do what they do for Apple at the price they are offering their app is beyond me. Regrettably, the app is not perfect. There are some small bugs in the player which need to be corrected. It does not always play every track. I have noticed that it may not play certain tracks at all. This did not happen very often but is a disappointment. This is a brand new app. With user feedback I am sure the professionals at Dirac Research AB will fix this. Regrettably, with extended use the app apparently caused my iPod Touch to go silent. I though my Touch had gone bad, but when I deleted the app all my sound came back. Clearly the app has some bugs. I would appreciate any user feedback while I attempt to get further information from Dirac Research AB.